Wow, Claire's is having some great clearance sales right now, with prices up to 75% off! You'll find tons of products on sale, including jewelry, makeup, accessories and much more. This is a great opportunity to get some early holiday shopping started! 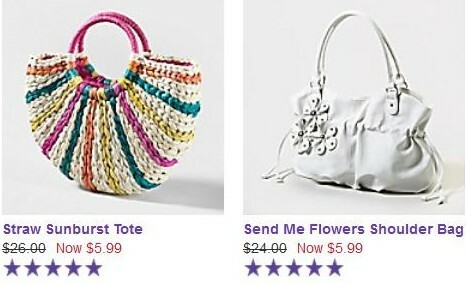 Straw Sunburst Tote: $5.99, regularly $26! 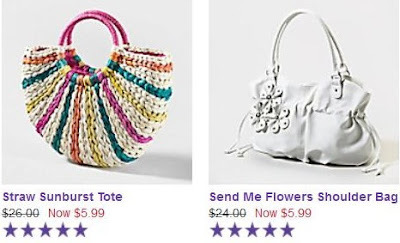 Send Me Flowers Shoulder Bag: $5.99, regularly $24! 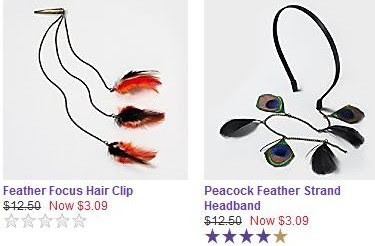 Feather Focus Hair Clip: $3.09, regularly $12.50! Peacock Feather Strand Headband: $3.09, regularly $12.50! To make these deals even sweeter, most of them are eligible for free 2-day shipping from ShopRunner! If you don't have a ShopRunner account, you can try the service for free for 30 days. You can cancel at anytime within those 30 days and not be charged anything! You can get more info on that by clicking here. NOTE: Claire's items that are advertised as "10 for $10" are not eligible for ShopRunner shipping. Click here to see all the clearance deals, and sort by lowest price to find the best ones!